Blog Energy Efficiency & Reducing Utility Bills	How much do replacement windows cost? Homeowners can sometimes dread a replacement project. Take windows, for example. Older windows show tell-tale signs when they need to be replaced. They can be cracked, warped, or have broken glass. Older windows aren’t as energy efficient as newer models. You may notice a draft when you’re near your windows, and you may notice an increase in your utility bills as your HVAC system works harder to maintain the thermostat temperature in your home. 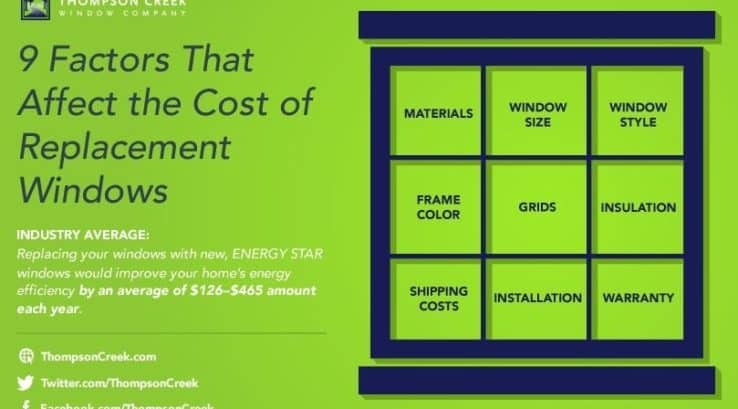 So how much does replacing your windows cost? The Federal Trade Commission states that new windows can range from a few hundred to a few thousand dollars per window, depending on a number of factors. Some of the factors that can affect the price of the window are materials, window size, window style, window frame color, grids, insulated glass package options, shipping costs, installation requirements and warranty. Materials: The material the window is made of will affect the cost. Most replacement windows are made of vinyl or wood. Vinyl windows need less maintenance than wood windows. Research shows that wood windows are generally more expensive than vinyl replacement windows. Size of your windows: Obviously, the size of your window opening will affect the cost – larger windows require more materials and will cost more. Some retailers sell replacement windows in a set number of sizes with no room for customization, which typically cost less up front because they’re manufacturing large quantities of the same size windows. You could try to make them fit into your existing window openings. But this often requires the use of wood shims, extra caulk and insulation, which will drastically reduce the energy efficiency of the window. And if you’re hiring a contractor to install the windows, they will charge more because of the additional installation time and materials. To maximize your windows’ energy efficiency, your best bet is to order windows customized to fit your exact openings. Typically, a window manufacturer will take the measurement of your window openings, deduct 1/4 inch, then specify the heights and widths to the nearest 1/8 inch. Type of window: The most common types of windows – double hung, picture windows, and slider windows – are all comparable in price depending on the size. Bay windows and bow windows require full reconstruction for their installation, so the higher installation cost is figured into the price. Color options: Most off-the-shelf replacement windows are available only in white. But some window manufacturers offer the ability to customize the color of your new windows to match or complement the exterior of your home. This custom option can add around 15%-25% to the price of the window. Glass Package: There are a large variety of insulated glass packages that can impact the price of the window. Triple pane windows are generally more expensive than double pane windows. Many windows use argon or krypton gasses to insulate between the glass panes. The type of insulating glass can also impact the price of the window. Window Grids: The decorative grids for replacement windows will also be a factor in the price. Window grids can be referred to as window grilles, window grids, mullions, window muntins, divided lites, or simulated divided lites. The style of window grids will also be a factor in the price. Shipping costs: If you are purchasing the windows yourself from a big box retailer, they’ve already figured the cost to ship them to their store into the price. The installation cost your contractor charges need to be figured in for your total cost per window. If your contractor is purchasing the windows for you, they will include their own markup for each window, with installation charges on top of that. If you purchase from a company who manufactures, sells, and installs the window, you save money by cutting out the middle man, especially if you work with a local window manufacturer. By eliminating those costs, you’re able to purchase a window at a lower price point. Installation: Installation costs can vary depending on the complexity of the installation. Double hung windows are the most common window style and most professionals have plenty of experience installing them, although there are certainly different installation techniques. Window styles such as bay windows and bow windows usually require additional reconstruction work during the installation process, resulting in a higher installation cost. Some windows will require framing a new rough opening for the new window, which means removing the studs and setting new headers in place. Warranty: The warranty on your new replacement windows may not be factored into the price. But looking at the warranty terms can provide a good indication of the company’s reputation and the quality of their products. For example, a 10 year warranty provides minimal coverage and a limit on the expense to conduct any repairs during the warranty period. If you face any problems with your windows down the road due to improper installation or a product defect, you will see an increase in your future cost if you have to repair a window that is beyond its warranty period. All of these variables will impact the price of your replacement window project. The best way to get an accurate price is to have a professional come to your home and evaluate your situation, present you with options, fully explain the installation procedure, and give you a written quotation for your replacement window project.